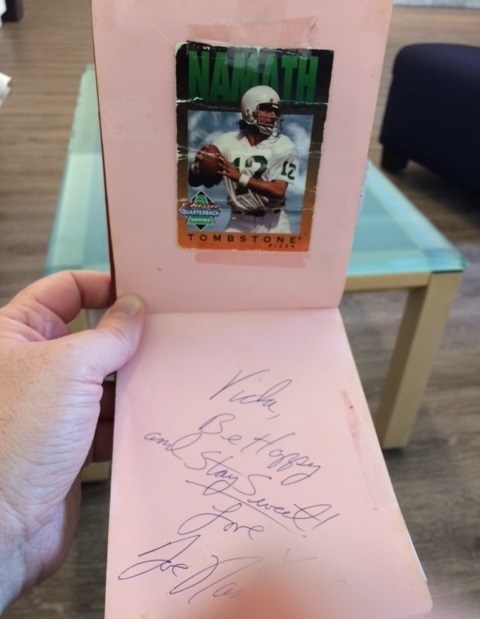 A woman named Davida Lawson of Fontana brought a keepsake into our office to show me: an autograph book in which she had signatures of 13 players or staffers with the 1977 Los Angeles Rams. 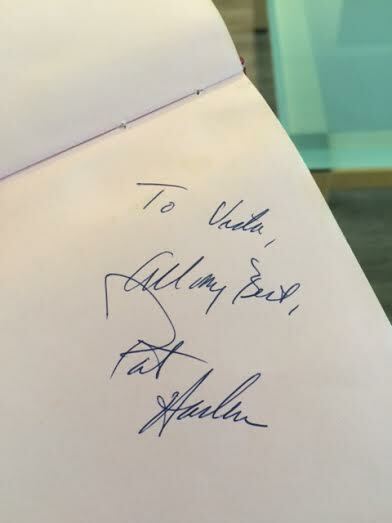 Among them: Joe Namath (above) and Pat Haden (below). She also got Rusty Jackson, Rod Perry, John Williams, Willie Miller and more. She and her fiance were living in Fullerton as he studied and worked in the cafeteria at Cal State Fullerton, where the Rams had their training camp that year. Players and staffers ate in the cafeteria and signatures were obtained. “Pat Haden was so good-looking back then,” Lawson said. And she was charmed by Namath, who was in his first season with the Rams, at the tail-end of his career; by the season’s fourth game, he was done. The Rams are headed back to L.A. — as you may have heard. 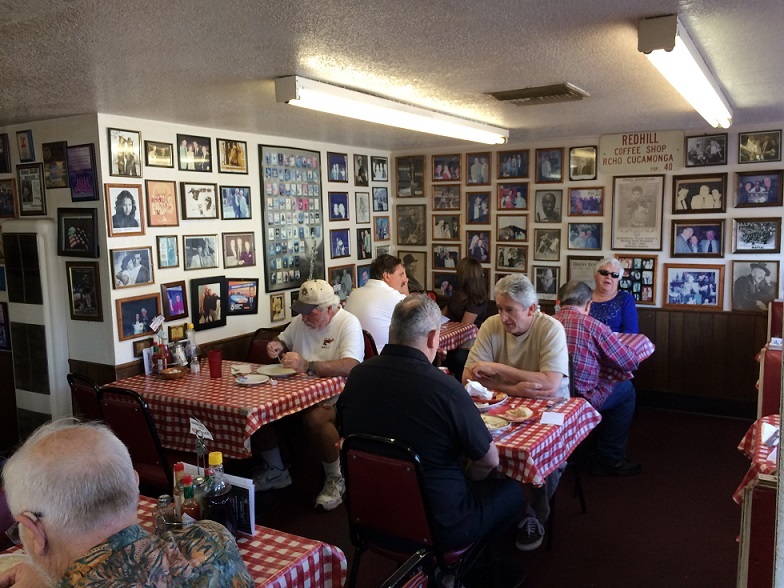 Red Hill Coffee Shop, an institution in Rancho Cucamonga, is changing hands as of Tuesday, with Jim Moffatt giving the place up after four decades. This end-of-an-era story is the subject of my Sunday column. In Friday’s column, we get an update on the plans announced in 2013 to name a street in Fontana after native son Sammy Hagar — which is that the development still isn’t built. After that: three Culture Corner items and a Valley Vignette about, of all people, a presidential candidate’s wife with a local tie. 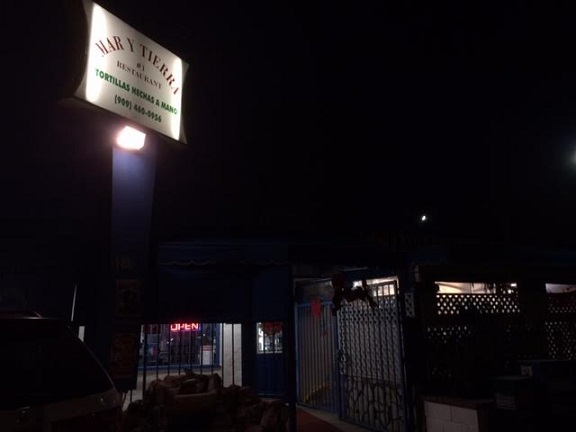 There’s a Mar y Tierra on Euclid near Chino that I pass now and then, and which a friend recommended years ago. Or was he praising the Mar y Tierra on Mission, only a couple of miles away, which I discovered via Google when searching for the address to the one I knew? Either way, I made plans with a friend to meet up, and at the one on Mission, as its blue paint scheme and more expansive size made it look more like the one to visit. It’s got an interesting layout: You walk in past a large covered entry to find yourself almost in the kitchen; a few tables are nearby, and then there’s an L-shaped seating area technically outdoors but almost entirely enclosed. According to the sign, this is Mar y Tierra No. 1. And for the record, Mar y Tierra translates as “Sea and Land” and is the equivalent of surf ‘n turf. The menu is heavy on seafood — shrimp, oysters, octopus, lobster — while also offering tacos, burritos, soups, breakfasts and combination plates, many with meat. 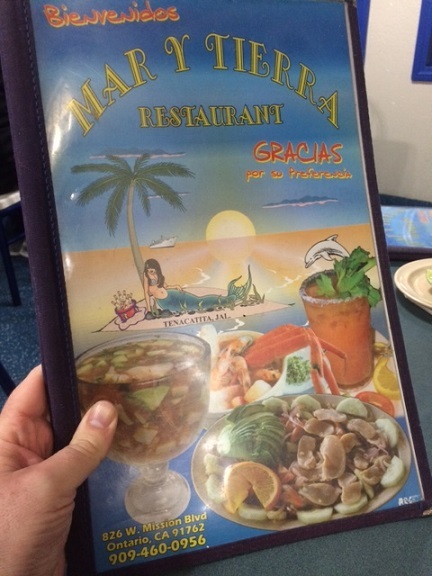 The menu’s cover depicts a mermaid on a desert island. I ordered the house special, pulpo, or octopus, “Mar y Tierra style” ($13); asked if I’d like shrimp as well, I said sure. 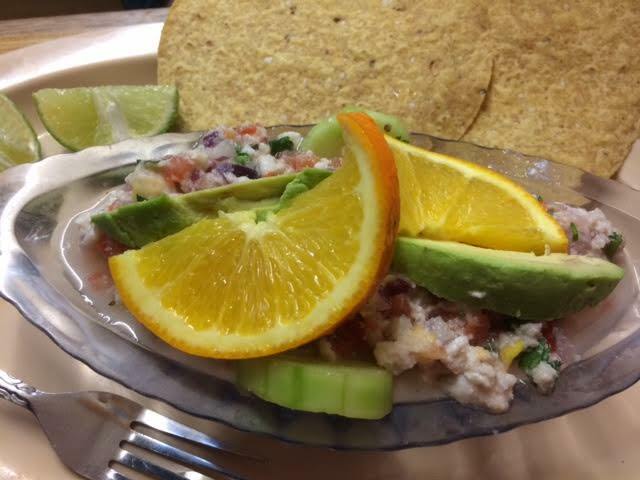 My friend, who apparently has an eye for bargains, had the ceviche de tiritas de pescado ($5.50). 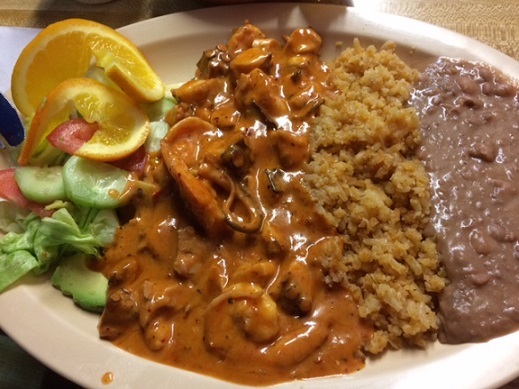 Mine came with shrimp and chopped octopus in a spicy sauce, plated with rice, beans and salad, tortillas on the side. It was a little spicy for my tastes, which is more a reflection on me than the dish, but was otherwise good. The ceviche was very good, lots of lemon, and with tostadas for dipping. The Euclid location is smaller and entirely enclosed. “I like the vibe of this one,” my friend said approvingly of the Mission location. Me too. Wednesday’s column begins with eight items from Rancho Cucamonga. (These had been planned for Sunday until the Chino Valley Unified news happened, bumping them to the next column.) After that, three Culture Corner items, plus, as the cherry on top, a Valley Vignette. 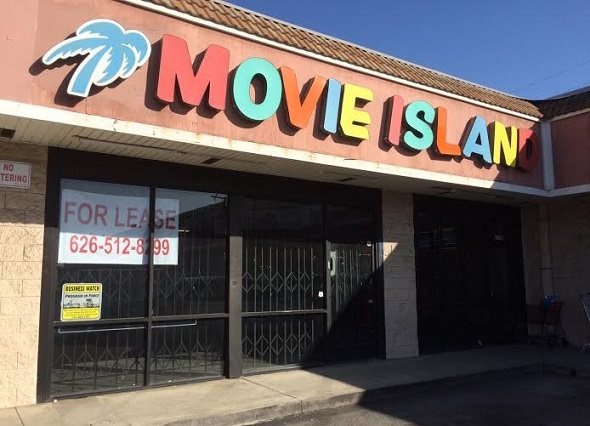 The video store Movie Island (746 E. Holt Ave. at San Antonio) had a fabulous sign: a palm tree and the store’s name spelled out in letters in not one, not two, but three different colors. It was hokey and arresting all at once. The store may date to the 1990s; it seems as though I’ve been admiring the sign the whole time I’ve lived here. The video holdout finally closed its doors recently. The latest from our friends on the Chino Valley Unified School Board occupies the top of Sunday’s column, followed by reaction to my Covina Bowl column, a plug for this blog and a vignette. How’s that for a headline? That’s the first of five Upland items in my Friday column. Then come three Culture Corner briefs, including one about the cartoonist of “La Cucaracha,” and an interesting fact about the L.A. County Fair: It’s getting shorter. Hungry before a council meeting in Chino, I figured I could find something along Central Avenue, vaguely recalling the location of a pho restaurant. 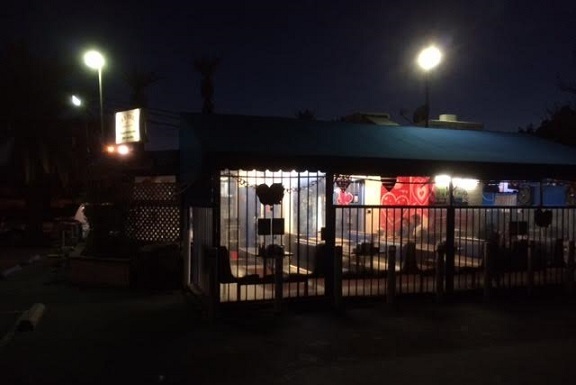 I pulled into a center just above the 60 Freeway with Goodwill and 99 Cents Only stores as its main tenants and realized I’d been here once before, trying a Japanese restaurant, Bento Box. 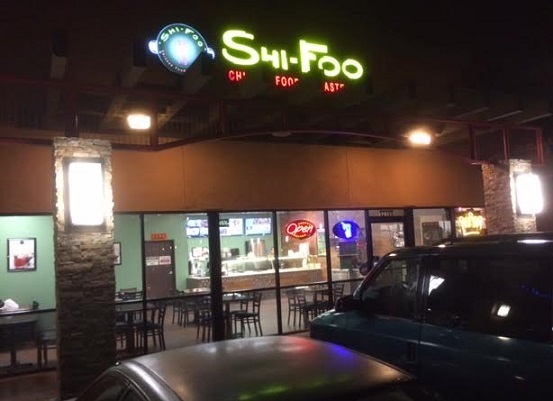 This wasn’t the center with Pho Express. Remastered? Would there be bonus tracks? It was just unusual-sounding enough to entice this music fan to enter. 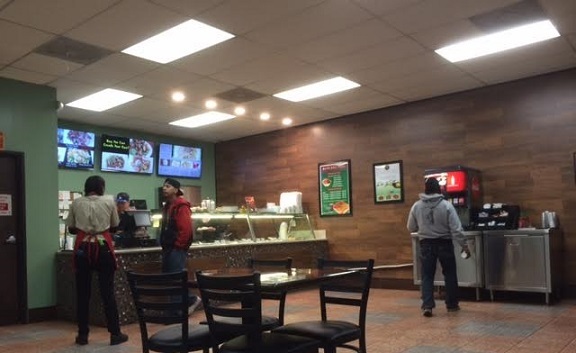 It looks like a typical quick-service Chinese restaurant, and in fact was a Happy Wok previously. They have steam table stuff if you’re in a hurry, chow mein and beef broccoli and orange chicken, all of which I bypassed — which is not to dismiss it. The menu says they use non-GMO cooking oil and that the orange chicken is made with real oranges, with no corn syrup. I went with the create-your-own-entree option, where you choose a protein, sauce and side. 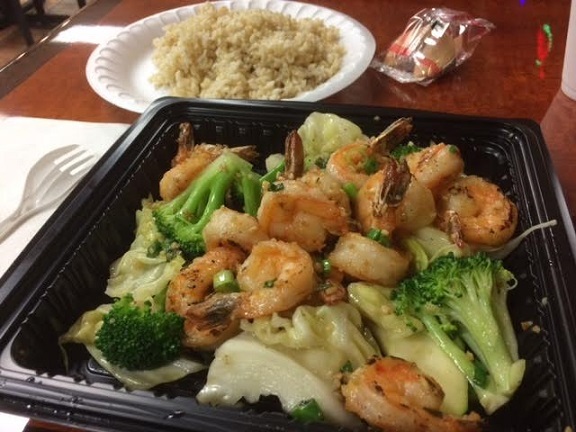 I went with shrimp with garlic sauce and brown rice ($10.50). In a bonus, there was a 5 percent discount for cash customers. As a guy who pays with cash, this was the first time I’d saved money by doing so, which put a spring in my step as I walked to my table. My food was made fresh and was ready in a few minutes. My goodness, it smelled good, very garlicky, and there were — I counted — 14 shrimp. They did not skimp on the shrimp. It tasted as good as it looked and smelled. Shi Foo was a pleasant surprise, one of those places you enter on a whim, knowing nothing, and walk out thinking you’ve made a find, in part because you had no expectations. But I think I would like it on a second visit even with my expectations raised. My fortune, reproduced below, was slightly mysterious, as a Chinese fortune should be, due primarily to what might (or might not!) be a superfluous comma. 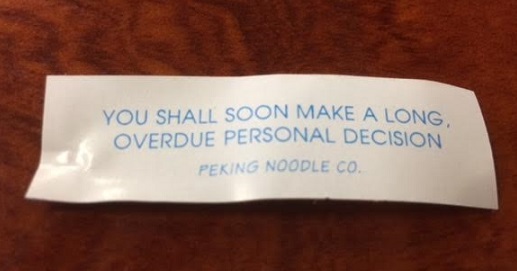 Exactly how much time will this decision require, anyway? I’d better get started. 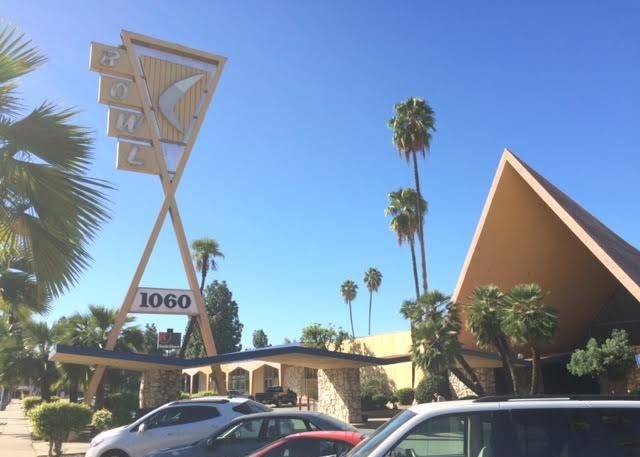 Wednesday’s column starts with a report on the bowling alley in Covina, which turned 60 last week. Have you bowled there? After that come three Culture Corner items and a few paragraphs about the Chino Hills High basketball team.